I'm impressed! I like the fact it is a good camera in low light situations, or indoors, that is the trouble with the cams I currently have, not all the best indoors in low light for a quick capture, without having to fiddle with settings, and then lose the moment. I do read a lot of reviews, and then think, there are so many good cameras, I wish I could just try them all to compare for myself! You are not alone in taking hundreds of shots and like you say this would have been a definate no no in the olden days of film. I tend to bracket a lot of my shots especialy in bright and contrasting conditions then at least I have a three to one chance of getting the right shot. I like your moon and was fascinated to see that when you view it in Oz, it is upside down from the moon we see here in Blighty. 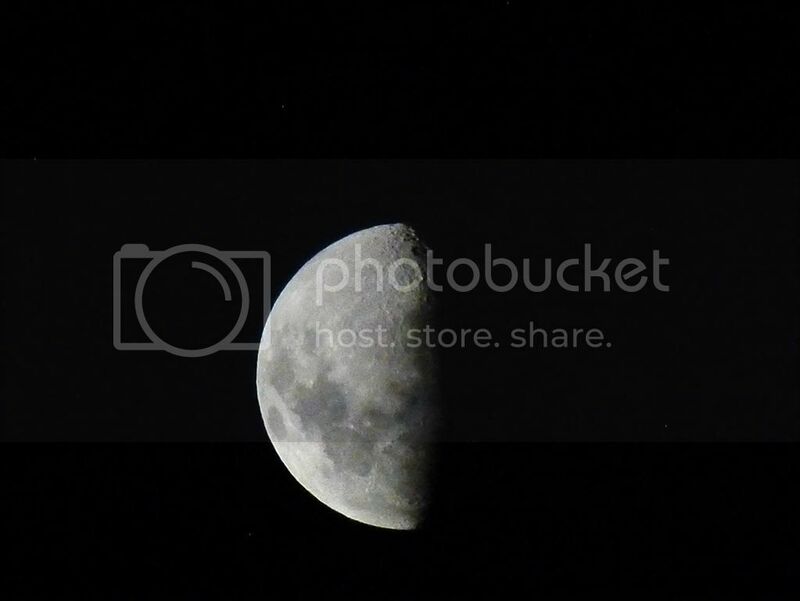 If you look at your shot carefully you will just see a small amount if chromatic aberration round the edge of the moon from about eight o'clock to eleven, this is very common in high contrast shots and the fact that you got an image hand held well, you must be steady as a rock. 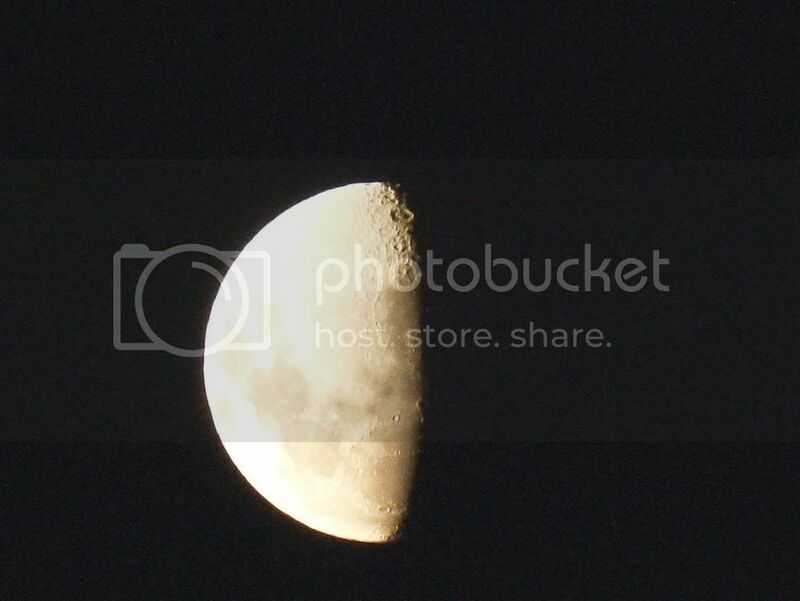 I have attached a shot I took a while back showing the moon from our side of the earth - this was shot on a tripod using a timer release - there is no way I could have achieved anything hand held. Pilot, if you download the images and then right click on them all the info you require is there. Wow, I see what you mean about seeing the moon differently from your side of the world. Quite fascinating. Meant to add...the moon on this particular night was really huge, which is why I remember going out to take the pics, so in a way, a huge closer moon helps with the steady hand shots somewhat Funny thing is, I noticed it seemed to influence and started them huge floods happening They say the moon effects water, tides, rivers, the sea etc. 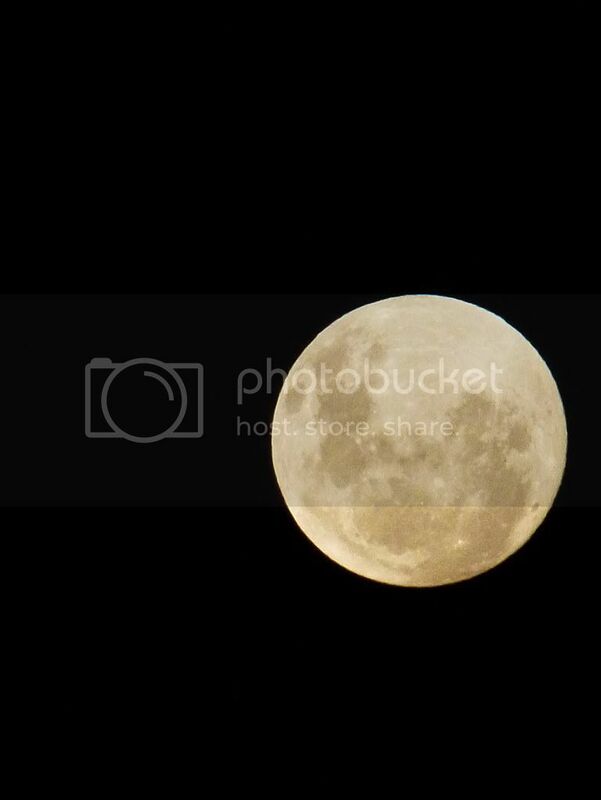 Last night was a good night to capture the moon as it was 20% nearer than normal. Westolad, that is an amazingly beautiful photo! And I think you should put it in this month's photo comp in Curly's cornershop, (March), since it is the super moon month. Like as if I am only going around with no lens But it is unfortunate about it being such a big heavy camera, but the photos it takes is something amazing, as I have been looking at photo samples in reviews etc. What lens do you have with your K-x? I thought a good all rounder to get was the 18 - 200 mm sigma lens. I traded in a 70-300 Olympus lense to off set the price of the K-x with the twin lense offer from Jacobs. The only reason I went to Jacobs is they do part exchanges etc. but the guy was a complete camera nerd and we took three cameras into the street to take samples against the K-x which he compared on the shop pc. The image samples convinced me that the K-x was the right camera at the right price - you get a lot of bang for your buck as the guy said to me! Awesome! Thanks Westoelad for the info. I do like the Pentax and the name is good, they have always been good cameras, and I certainly have seen the proof in the pudding with your photos you post although I have always sort of bought either Canon's or Panasonix Lumix, I wanted to go with something different. Was thinking of the Sony Alpha A55, which is still in the almost reasonable price range, and a nice lighter smaller camera for my hands to handle. The Sony has this new 'mirrorless' technology. I would just love to have both the cameras and test them for a few days, download the pics, and then truly see which one is user friendly and better on the puter screen to view. I wonder if my friendly camera store would trust me with both Well, I just might ask in the next week or so, of course, they will have my credit card details I know that Ted's camera store have a lemon policy, or some other policy if you don't like a camera you bought, they would exchange it within 14 days or something like that, I might go to their store, and find out more about that policy. A friend said, you can take out an expensive car and test drive it for a while, but not a camera. westoelad, spectacular photo. If i were you, I would definitely put it in the competition, so more people get a chance to see it. In the meantime, I have been made aware from one of the lovely salesperson at a camera store, of a great camera with good low light photography, a compact Sony HX7V wtih 16 MP and 10 optical zoom, or HX9V with 16 optical zoom. It has a cmos sensor which is better for low light photography, and even indoors, with the zoom extended out, still captures plenty of detail in the photo. Another good contender is the Canon SX230HS. the ISO you use the more noise you will get in your photos. the lens with the lowest ƒ number ƒ1.2 - ƒ2.8 - ƒ3.5 - ƒ4.6 - ƒ8 - ƒ11 - ƒ22 will work best in low light conditions. Thank you so kindly for all that info I have noticed when doing comparison with cameras on a webstie called 'snapsort' that it mentions whether it is an 'f stop' better or not, and it just goes over my head, but now I think I am understanding it better. My camera has a new f setting for beginers...."f off" its the one i use the most. My first camera was a Kodak Brownie Danet in the 1950s but sadly I'm still a beginner, luckily for me the technology is so much better even I can take a half decent picture, but I don't think I will ever be more than a happy snapper.